← RIGHT NOW What do I need? Henein, Georges (1914-73). Egyptian poet, editor, and journalist. 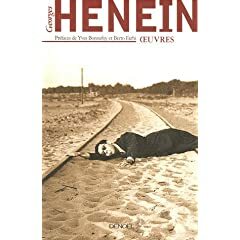 For over a decade (1937-48) Henein led an active Surrealist group in Cairo, keeping up its contacts with the main movement and writing many poems, tracts, manifestos, and short stories (Déraisons d’être, 1938; Pour une conscience sacrilège , 1945). After a rift with Breton , Henein created a more informal and eclectic grouping, centred on the journal La Part du sable, where Egyptians figured alongside French writers such as Bonnefoy, Henri Thomas, and Jean Grenier . When, like his Jewish friend Jabès, Henein (a Copt) bowed to Arab nationalist pressures and left Egypt in the late 1950s, he turned to political journalism. Although from 1956 he eschewed publication, he never stopped writing creatively, and the works published since his death, including Pour un pays inutile (1977), La Force de saluer (1978), and L’Esprit frappeur (1983), have attracted increasing attention as they reveal an unusual alliance of intellectual brilliance, polemical drive, and poetic fancy. He seems to be very well-known in France and not here in Cairo!!!! That’s very weird!! So Did anyone read for him anything?? الخلاصة أن جورج حنين قام بدور مزدوج شديد الأهمية في تاريخ الإبداع المصري الحديث : فتح فيه عالما جديدا من الأفكار والتصورات والأساليب ذات الوهج الثوري والحالم في آن . وأدخل هذا الإبداع من جهة أخرى في آتون حركة الفن العالمية بما جعله جزءا منها ، وجعل مبدعين مصريين متميزين معروفين في أوربا ومشاركين في نشاطات ثقافية طليعية فيها . This entry was posted in Books, Cairo, Culture. Bookmark the permalink.